A Christian friend is “claiming her boys for Christ,” even if the rapture occurs. Is this sound? The first is a matter that has appeared in these columns previously. Those who, during the tribulation, have “received not the love of the truth, that they might be saved” will be damned (2Th 2:10, 12a). They did not believe the truth, but had pleasure in unrighteousness (v 12). By the middle of the seven year period, these will have had sufficient truth that they could have been saved, but they chose not to believe that truth. The result is a judgement assigned by God that, although they are still living, they will be deceived and subsequently damned. They will see the fulfillment of God’s Word in “the abomination of desolation” (Mat 24:15) and their doom will be sealed. The second concern is equally sensitive. “Claiming our children for Christ” because we have prayed for them could be sound. This could be a statement of confidence in God, knowing that He is kind (Luke 6:35), shares our concerns (1Pe 5:7), and loves to answer prayer (Psa 65:2). This is proper and grows out of a vibrant relationship with our Father. Such a statement of trust does not, however, obligate our Father to do what we have asked; it is a matter of trusting Him. On the other hand, if the statement amounts to a bargain with God, it is seriously misguided. If something a believer does places God under obligation or makes his children more “savable,” will that child be saved by grace or by his parents’ works? Praying fervently (Jam 5:16) and urgently for his children’s salvation is becoming for a Christian parent. Anything less would seem uninformed. At the same time, humble confidence in God is always sound. 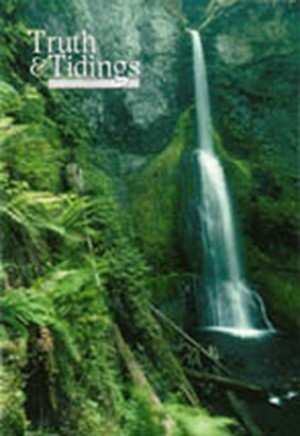 Beginning at the end of 2004, Truth and Tidings printed our brother Lloyd Cain’s helpful series on great gospel words. A few brief comments at this point might once more “put us in remembrance of these” great gospel truths. Both truths are outcomes of that once-for-all work the Lord Jesus accomplished on the cross. Redemption focuses primarily on the blessing the one who trusts Christ receives. Propitiation points to what God has received from the death of Christ, whether or not a sinner trusts Christ. Redemption paints the sinner as a slave of sin and emphasizes three truths through three New Testament words. When Paul speaks about being redeemed from the curse of the law (Gal 3:13), the word tells us of the purpose of redemption. We have been bought out of the slave market of sin, delivered to serve righteousness. Paul again tells us that we have been justified through the redemption that is in Christ Jesus (Rom 3:24). This word emphasizes the power of redemption, delivering us completely. The third word draws our thinking to the price of redemption. Paul says “He gave Himself that He might redeem us” (Titus 2:14). What a price! Peter uses the same word to tell us we are redeemed “by the precious blood of Christ” (1Pe 1:18, 19). God is the loving, yet righteous One Who paid a great price to deliver and bless us. Propitiation emphasizes the holiness and majesty of God, Who has been dishonored and affronted by sin. So infinite is the value of the sacrifice of Christ that in that death God has received full satisfaction for the offense of all sin! That satisfaction is through the blood of Christ Jesus (Rom 3:24, 25), addresses our sins and the world’s (1Jo 2:2), and is the foundation of all blessing that will ever result from the death of Christ (1John 4:10), as pictured in the blood sprinkled on the mercy seat (the propitiatory, Heb 9:5; a related word). Is Isaac’s promise to Esau (Gen 27:40b) fulfilled or being fulfilled at present? Jacob said to Esau, who had pleaded for some blessing from his father, “by thy sword shalt thou live, and shalt serve thy brother; and it shall come to pass when thou shalt have the dominion, that thou shalt break his yoke from off thy neck” (Gen 27:40). The question refers to the words in bold text. If, as it seems to be, Edom is associated with Esau’s posterity, Jacob’s seed has suffered under Esau’s posterity on a number of occasions in history. The line of the New Testament Herods provides one example. The likelihood is that the prophecy of Isaac has been a characteristic response of the Edomites to the Jews. The present conflict in the Middle East is a further illustration of this. We are seeing that character of this conflict repeated. Obadiah tells us of the time when this condition will be changed: “Upon mount Zion shall be deliverance, . . . and the house of Jacob shall possess their possession . . . And saviors shall come up on mount Zion, to judge the mount of Esau; and the kingdom shall be the Lord’s (Obadiah 17, 21).